Use three equal zones on a full field of 30 - 35 yards. Play 8 v. 8 with keepers. Teams play possesstion in the middle third of the field. When there is a turnover, the deepest player on the attacking team makes a run towards goal and finishes on frame. Goalkeeper plays ball back into the middle to restart game. -Limit the amount of touches in the middle third to promote speed of play. -Add further attackers and defenders as apart of the transition to goal. -The team that loses the ball, applies immediate pressure on the ball to prevent a through ball. 7 + Goalkeeper vs. 5 on a field 25 x 50 yards. Gray team attacks the goal. Blue team plays to the small goals at midfield. Gray Team must transition to goal within 4 touches, and Blue Team must play two touch to small goals. Three even numbered teams, two goals with keepers, with the field set up into three zones. Team 1 will attack, Team 2 will defend, and Team 3 will wait. Team 1 attacks the goal and if Team 2 wins the ball, they attack Team 3. Teams may regroup in the middle zone. If attacking team scores, they maintain possession and attacks the third team. 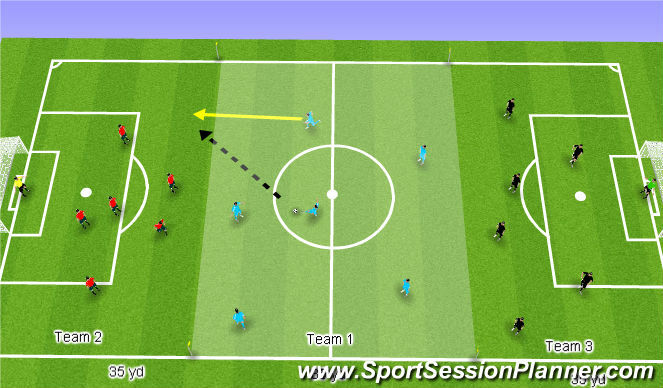 -Attacking team in the middle zone is allowed no time to gain there shape. -Possession when the attack is not on.